As you climb the slightly steep slope of prefectural road Route 144, which extends northwest from the south side of Matsushima Kaigan Station, you will find "Saigyo-modoshinomatsu park". It is a famous spot of cherry blossoms with over 260 cherry blossoms. It is also the origin of Saigyo Hosh, who had been a country pilgrimage. From the observation deck with white coat Kannon. 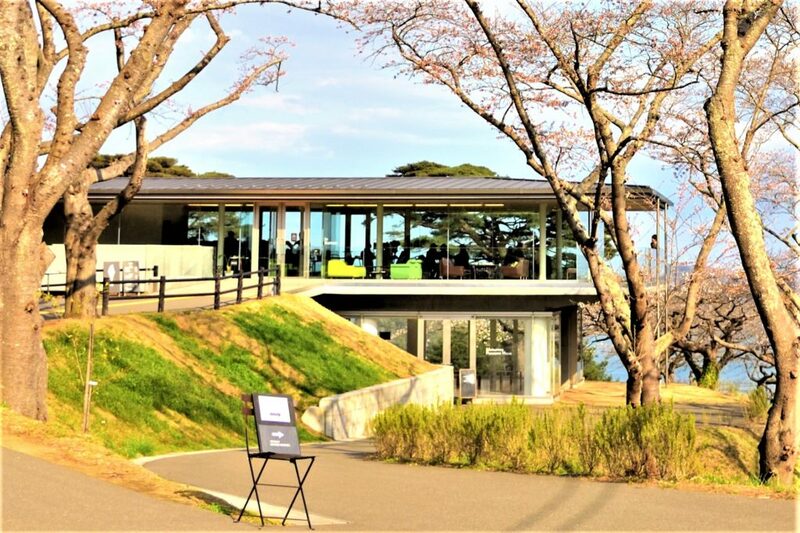 you can enjoy a beautiful and harmonious view of cherry blossom trees and Matsushima Bay. In addition, white magnolia blooming in full bloom is added to the scenery. The refined scenery of Matsushima fits like a great picture in the forehead and highlights the tranquility. There was a café in the park, surrounded by a glass with a good view. It is a cafe "le Roman" run by the Shokado pastry shop along the coast. It seemed to have been operating as "Cafe Rowan" from June 2007 until the Great East Japan Earthquake, but it was closed due to the damage to the building. At the request of the locals, "Cafe Rowan" re-started the damaged building as "Le Roman" and started in October 2015. It is an open and stylishly decorated cafe, but it seems to be loved by the local people as a daily use cafe as well as tourists. Many people were visiting even on weekdays. The scent of salmon was wonderful, and the homemade cheesecake was delicious, and I was able to spend a time of bliss while watching the superb view of Matsushima by the window. View the Matsushima ‘s Sunrise from "Saigyomodoshinomatsu Park"
Matsushima Town also suffered damage to shops and facilities, including sightseeing boats, due to the earthquake and tsunami. However, it is said that the islands of Matsushima Bay protected Matsushima Town and escaped destruction miraculously. Along the coast, there was a steady resurgence towards safer maintenance. The people of Matsushima feel that Matsushima should be restored quickly and must serve as a receiving source for tourists and people supporting reconstruction for the Tohoku earthquake disaster reconstruction. I think that the sense of the mission of Matsushima townspeople, fishermen, farmers, and tourism operators are linked to the early recovery. I wanted to see the morning sun rising from the sea of Matsushima in the early morning and visited "Saigyomodoshinomatsu Park". Once in the park, many tourists and locals are already looking at the east sky. 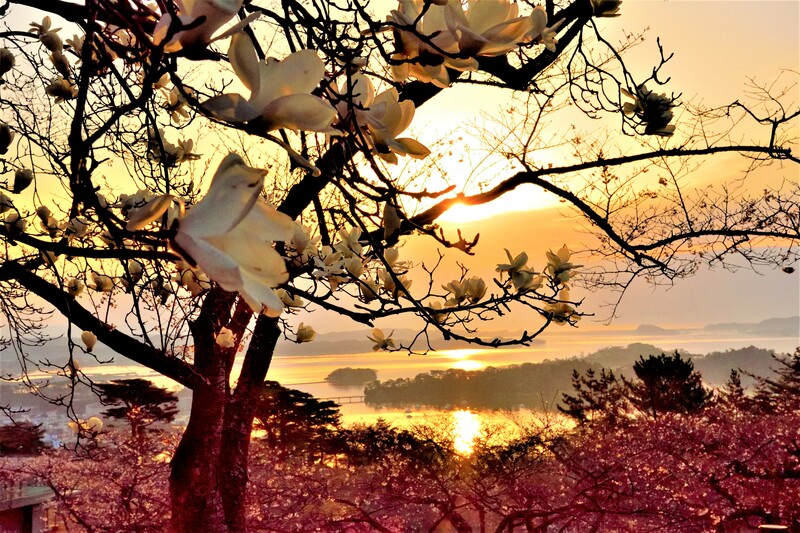 At sunrise time, in the eastern sky, there were still clouds, but the sunlight from above the clouds was illuminating White magnolia, cherry blossoms, and the sea of Matsushima. Everybody in the place shared an unforgettable radiance, with various thoughts in it. Matsushima, a scenic spot in Miyagi Prefecture, is a place where Basho Matsuo is not only breathtaking, but also a place of reverence as a sacred place. In the approach to "National Treasure Zuiganji", the tsunami of the Great East Japan Earthquake struck and restoration was being carried out. As a result of salt damage caused by the tsunami at the time of the earthquake, the cedar trees were severely damaged, and 300 cedar trees were withered and harvested. A steady effort is being made towards rebuilding the approach and surroundings. Zuiganji is a majestic building representing the essence of the Momoyama period, built by Masamune Date in 1609. The "Heisei's Great Repair", which began in 2008, will end in November 2017 last year, will be completed in March 2018, and will receive Lokage on June 24. “Garyu plum”, which was brought back by Masamune Date, had beautiful red and white flowers. The person who was guarded told me that the fallen cherry blossoms in the back of the main temple of Zen temple are wonderful, and when I went to the back of the front, the cherry blossoms bloomed in full bloom in the blue sky that I was looking for. It was a magnificent beauty as if celebrating the completion of the "Heisei Great Repair". In front of "Entsuin", which was opened in 1647 as a mausoleum for Grandson Mitsumune of Masamune Date, a wonderful branch cherry blossoms were also illuminated in the sun. It is a beautiful stone garden that appears when you go through the gate of the thatched roof and leave the "Kannon". This stone garden is made up of a "garden of the sky" expressing Matsushima Bay and a "garden of the ground" expressing life. The magnificent garden in front of the main hall is called "Enshu Garden" and is said to have been created by Enshu Kobori, a representative gardener of the Edo period. In the garden where the pond of the heart shape is arranged and the maple trees are colored, a light green bamboo forest shines in the blue sky. When autumn deepens, the garden will turn red and be more beautiful. The seasons are full of greenery and the seasons of snowfall are also unique, so you can feel the change of the four seasons. At the back of Entsuin is "Sankeiden" which sings the Mitsumune Date. The father of Mitsumune, Tadamune (the second generation Sendai lord), was erected in honor of his son's death. Sankeiden is said to be the oldest in Miyagi Prefecture as a spirit house architecture, and has been designated as an important cultural asset of the country. Sankeiden was surrounded in some places with fresh green moss, and it was reflected in bright light and was shining in high spirits. The caves, which have existed for about 700 years, have carved out the time of the unnatural in the quiet like a world that is different from the world that has undergone major changes.